Capt. Tom E. Doran grew up in the Bryan/College Station area in Texas where his father was a Professor and Head of the Geography Dept. at Texas A&M University. Tom was born into a 'sailing family' as his father's academic specialty was nautical geography, so he learned to sail at an early age. He was around his father and his father's sailing contemporaries while growing up and learned about sailing vessels and sailing-related activities, as well as building sailboats. As a teenager, Tom was a member of the Sea Scouts section of the Boy Scouts and a member of the Brazos Valley Sailing Club. He spent many afternoons on Lake Somerville near Bryan/College Station as a 'journey-man' sailor. Tom learned even more about sailing in The Gulf of Mexico, as well as traveling to exotic locations around the world including the Micronesian Islands. In the summer after high school graduation, Tom went as a cadet and crew member on a summer cruise, known as 'The Summer School At Sea, aboard the Texas Clipper, a large teaching ship sponsored by Texas A&M University-Galveston Moody College. While enrolled as a student at Texas A&M, Tom was a member of the Texas A&M Sailing Club and was on the Aggie sailing team. Tom took time off from college to spend a couple of semesters in the Bahamas and in other Caribbean locations as a crew member on large sailing yachts, further enhancing his already rich sailing knowledge. After Tom graduated from Texas A&M with a B.S. degree in Sociology in 1975, he headed for Miami to crew on numerous large sailing vessels that sailed the Caribbean. In January 1981, using his extensive knowledge of both sailing and business sales, Capt. 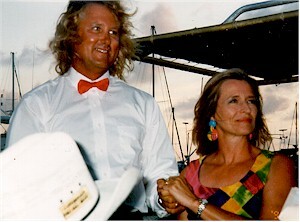 Tom originally located in Galveston and started his company, Handsome Sailor Yacht Charters (HSYC). At this time Capt. Tom studied and passed his requirements for a U.S.C.G. Captain's License. After receiving the license in 1981, Capt. Tom did extensive chartering on his Catamaran, the S/V ISLA, in Galveston Bay and on the upper Texas coast. He operated Handsome Sailor Yacht Charters in Galveston until 1991 then moved his company headquarters and business to Aransas Pass (just north of the Corpus Christi), where HSYC headquarters is presently located. "The Captain and First Mate of HSYC"
CALL OR E-mail US TO SET UP YOUR CHARTER TODAY! in your e-mail reservation request.